Vintage everything is hot right now. Remember the Razr flip phones from the early 2000s? Motorola just announced they’re set to make a comeback and will soon be on the market for over a grand. A cool $1,500 to be exact. Who would have thought? Vintage Rolex watches will always be in demand, and we’ll happily keep paying premium prices. Let’s revisit one of our favorites- the Rolex Daytona 6239. Remember a few years back when the Paul Newman Daytona was discovered and sold at auction for a record breaking 17.8 million dollars? They don’t all get that amount of media attention, but they’re definitely worth checking out, especially on the heels of the 24 Hour Daytona race on January 26. What’s so great about the Daytona 6239? Collectors flock to vintage Daytonas. The original Daytona 6239 models are extremely rare, which is why they sell for outrageous prices at auction. Daytonas have only seen subtle changes since their debut in 1963, and buyers gravitate toward the classic look. The Rolex Daytona has reigned supreme as one of the brand’s most legendary and iconic watches. It looks damn good on any wrist and compliments everything from jeans to a suit. Early model Daytonas were built to last with their almost indestructible Oyster cases. These daily wear watches boast impeccable craftsmanship and can span generations if properly cared for. Rolex has been crafting chronographs since the 1930’s, but early variations weren’t popular with watch critics. Earliest models were equipped with third party calibrations in conventional, stainless steel cases. The first oyster cases were introduced during WWII, but still to no avail. Other watch brands had already established themselves as chronograph experts. These pre-Daytonas with silver or black dials and stainless steel cases are in high demand today, but rare to find. Fast forward to the late 1950’s when Daytona area automobile races transitioned to asphalt. The first auto races were organized in the early 1900’s and were held on the beach. The Daytona International Speedway opened in 1959, and a few years later Rolex was awarded official timekeeper status. Rolex sponsored the first ever 24 Hour Daytona in 1962 and the Cosmograph Daytona was shortly conceived to celebrate the partnership. The 24 Hour Daytona is a sports car endurance race held annually during the last weekend of January and marks the first major automobile race of the year. 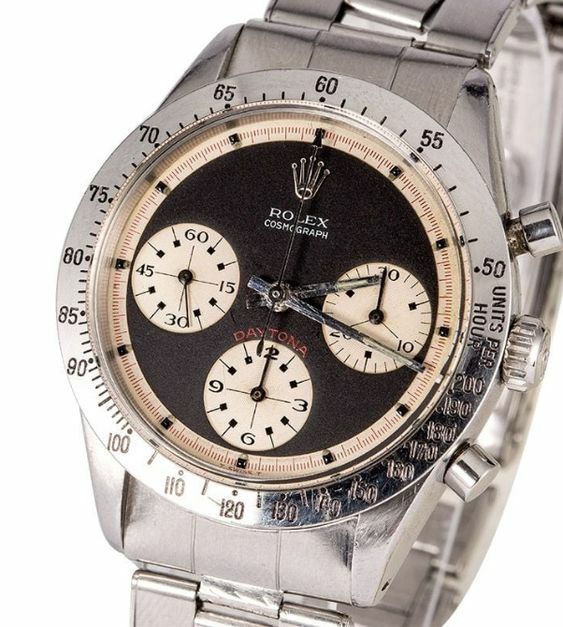 The Rolex Daytona 6239 was the first model to feature inverse color subdials, also known as the ‘Panda Dials.’ The typical color combination on this dial is black and white. The engraved tachymeter bezel feature was also introduced on the Daytona 6239. These features combined allowed drivers to calculate their speed in real time. Around 1967, the early bezel, originally graduated to the 300 mark, was dropped down to the 200 mark. The ‘Daytona’ name on the dial was moved from the 12 o’clock position to just above the 6 o’clock sub-dial, where it still remains today. If you’re lucky enough to own an early model Daytona- congratulations! Vintage Rolex Daytona models remain an all time favorite for Rolex connoisseurs, and their market value continues to climb. For anyone that’s on the hunt for a vintage watch- the Rolex Daytona 6239 would be a freaking excellent addition to any collection. If you are interested in purchasing your own Rolex Daytona (or any model), give us a call or fill out our contact form. Check out our Facebook page for box openings and watch reviews by our in-house watch expert Sergio Nuncio!